Mosquitoes are annoying. They also pose a serious risk to public health. Mosquitoes transmit diseases like West Nile Virus, Equine Encephalitis, and many other viral and parasitic illnesses. Controlling mosquitoes requires a comprehensive plan for eliminating breeding and roosting environments by applying chemical and biological solutions. 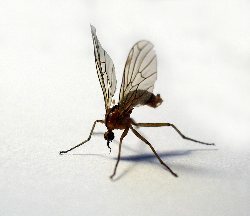 The best way to enjoy your yard during the warm weather months is to call us for a complete mosquito treatment. First, we break the life cycle of mosquitoes by applying a larvacyde to areas of standing water such as rain barrels, bird baths, gutters, etc. Secondly, we focus on the adults. Most mosquitoes, native to our area, avoid direct sunlight and roost during the day. We use a power mister to apply a residual pesticide to the roosting areas. The power mister will reach up into the trees, under decks and eaves, and any area providing the shade mosquitoes need. This product will not harm plants or trees; and once dry, is safe for you and your pets. Almost all the customers we treated in the last 3 years were so pleased with the results that they have continued to contact us for mosquito treatments in the spring and summer. Our experience indicates our mosquito control lasts for a couple of months, and the average cost is $65.00-$80.00 per application. To make your outdoor environment an enjoyable place for you and your family to hang out, Contact Us today. If you are planning an outdoor event we can insure that your guests won't be bothered with mosquitos or pests!